Cook rice or use leftover brown rice, fry corn and combine other ingredients. 82 members have added this recipe to their cookbook. 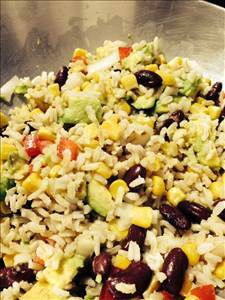 There are 151 calories in 1 serving of Brown Rice, Bean & Corn Salad. Calorie Breakdown: 15% fat, 68% carbs, 17% prot.